A book that covers the business and culture side of computer games is being published this month, it is written by Dr Aphra Kerr of the NUI Maynooth. 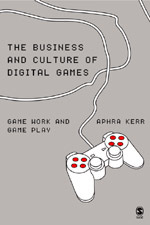 ‘The Business and Culture of Digital Games - Gamework and Gameplay’ according to the publisher’s website is “Written as an introductory text for media and game students this book aims present an overview of industry and scholarly work on who makes games, where they get made, what kind of media and cultural form they are and who plays them and where”. Kerr lecturers at the Department of Sociology in Maynooth, and is the project manager, editor, and founder of GameDevelopers.ie. Sage Publications publish Digital Games at a price point of £18.99 paperback or £60 (around 27 or just under 90 euro) hardback.